de Bruijn M. et Bouju J. ed., 2014, Ordinary Violence in Africa, Coll. Africa series, Leiden, Brill. Ordinary social violence, – i.e. recurrent mental or physical aggression occurring between closely related people – structures social relationships in Africa, and in the world. 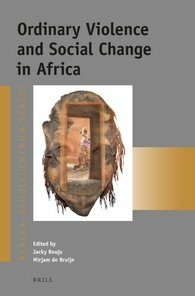 Studies of violence in Africa often refer to ethnic wars and explicit conflicts and do not enter the hidden domain of violence that this book reveals through in-depth anthropological studies from different parts and contexts in Africa. Ordinary violence has its distinctive forms embedded in specific histories and cultures. It is gendered, implicates witchcraft accusations, varies in rural and urban contexts, relates to demographic and socio-economic changes of the past decades and is embedded in the everyday life of many African citizens. The experience of ordinary violence goes beyond the simple notion of victimhood; instead it structures social life and should therefore be a compelling part of the study of social change.